Since its first film Toy Story was released in theaters over 20 years ago, PIXAR Animation Studios has almost always had book releases, chronicling the making of their films (the exception was Toy Story 2, given that film’s last-minute reshuffling). Chronicle Books continues the tradition with the recently-released The Art of Inside Out. However, what is most surprising, is how the book is presented. Though the dust jacket and main titles page tells of a foreword by Amy Poehler (the voice of the character named Joy), and an introduction by director Pete Doctor, the book contains a first-time change for this particular item…the book, has no author! Instead, Pixar has chosen to give us a book in which the pictures and the artwork speak for themselves…well, along with a few choice comments here and there regarding various pieces of art. This is both fascinating, but a little disappointing. While I am not disappointed in the lack of art, I was personally hoping the book might have gone into the more in-depth behind-the-scenes format I’m used to. With so many emotions, I likened the film’s “casting process” to being almost like Walt Disney and his guys, picking out the 7 Dwarves for Snow White. There are a few designs for a character named Gloom, but other than that, the book sticks squarely to the main five: Joy, Sadness, Disgust, Fear, and Anger. As well, there are so many ways the story could have gone, in what the film did and didn’t do. I can only hope that somewhere down the line, maybe we’ll get something a little more in-depth regarding the formulating of the film’s story. I always welcome the chance to see pen and ink, along with pencil in concept art. In the last 5-8 years, the majority of concept art seemed to be all done in digital (which was a little sad to me when looking through The Art of Toy Story 3 five years ago). With this production, it seemed that all manner of medium was used. As well, the book also showcases some of the first collage concept art I’ve seen done by the studio, since the making of The Incredibles. Oftentimes, the characters are some of the most important pieces of the puzzle, and here, we see a number of them going through different iterations. Much like Honey Lemon in Disney’s Big Hero 6, PIXAR had a tough time trying to crack the nut in designing one of the characters in this film, and that happened to be Disgust. A 2-page spread shows several dozen different iterations, of which 5 can be seen below. I think it’s safe to say that throughout the entire process, it seems that broccoli was the main inspiration for quite a few. One interesting use of the art, is in how the artists would ‘plus’ the digital models. In one, small post-its have been placed over portions of the poses for Fear. Oftentimes, computer models can have the problem of needing to be pushed further, to make the character more expressive. The few images below, show that with just the slightest of tweaks, the added changes make the character seem much more expressive, and feel like a proper extension. There’s 3 full-page examples in the book, and seeing what was done here, I almost want to see some more “plussing” on what was done. Though characters do play a big part in the story, the artists also had to figure out how to construct the two worlds of an 11-year-old girl named Riley. On one hand, they had to figure out her exterior surroundings, but the real challenge, was just what the world inside her mind looked like. Numerous pages are filled with concepts, showing just how certain thinking facets could be visualized, let alone the look of the iconic “Headquarters,” where Riley’s emotions live. Most notable about the look of these worlds, is how simple a lot of the art pieces are. Several of them reminded me a little of the simplicity of the artwork, of former Disney artist, Mary Blair, who is often cited as an inspiration by many artists. Probably not since The Art of Big Hero 6, have I been a little let-down regarding what one of these “Art-Of” books has contained. Though The Art of Inside Out showcases much of the great behind-the-scenes art the studio is known for, I also come to these books, wanting to read some interesting stories about the production. I guess I was spoiled by The Art of Toy Story 3, in which author Charles Solomon got down-and-dirty, in talking about the facets of the story the filmmakers were trying to tell. Then again, Solomon is an animation historian who just pushes my buttons. The Art of Inside Out’s “show-don’t-tell” approach isn’t a bad thing, but it’s just not what I was expecting, from something that could very well have had plenty of paragraphs,explaining how the filmmakers came to some of their conclusions. When I looked over the book, its format reminded me of the exhibition catalog I bought, for the PIXAR: 25 Years of Animation exhibit that appeared in Oakland, CA, in 2010. Given the overly-positive vibe many have gotten from the film, I still hope that maybe there’ll be a properly-published work on the exploration and story meetings regarding Inside Out. The concept of bringing emotions and the human mind onto the screen is just too fascinating for me to let go, and I’m sure many other PIXAR and animation fans, will definitely hope something will be released, in which we pick the filmmaker’s brains for more behind-the-scenes material. The return of Star Butterfly and her adventures in episode 6, brought about some changes for the Princess of Mewni, both to her, and to the show. The episode also signaled the start of animation by the Philippine production house Toon City, after Mercury Filmworks in Canada had to let go of the production (after their animation workload became too cumbersome). Episode 7 brings us two new segments to add to the (slowly) growing collection of episodes…so let’s dive right in! Ludo and his minions have once again turned the Diaz’s backyard into a battleground for Star’s wand. However, one of the minions named Lobster Claws is given ‘one job’ to do, and fails at it…causing Ludo to quickly fire his lackey. With nowhere to go, Lobster Claws turns to Star and Marco for help. Though Star is convinced that monsters can’t be changed, Marco tries to think positive, and is willing to help him out. I’m sure many of you are already thinking the same thing as I was: “Sounds eerily similar to Disney’s Wreck-It-Ralph.” Even so, the writers manage to do their own spin on the bad guy who doesn’t quite “get” what it means to be good. After he disappeared into a black hole in the Quest Buy segment of episode 4, I didn’t think we’d see Lobster Claws again…but, I guess Ludo’s minions eventually find their way back to him, no matter which dimension they end up in. As well, we get to see that he has a strange habit of running backwards (though he walks forwards?). The jokes in this one are largely visual, and rely quite a bit on timing. Some are predictable, while others managed to make me chuckle quite a bit. I can be a little jaded when it comes to some episodes featuring Ludo and his minions, but this one seemed to work pretty well, and we even get a tinge of darkness during the final minutes of the episode. Plus, Star gets to deliver quite a few new spells from her wand, to rain down some tasty-yet-painful vengeance. Also, for eagle-eyed viewers, there’s a little (gross-out) joke for a split-second, that deals with the effects of gravity. That’s all I’ll say. I’ll leave it to you to see if you find it, and whether you’ll chuckle…or retch. After finding the downstairs living room has been turned into a jungle, Marco suspects Star, but she claims she had nothing to do with it. The next night, Marco finds out that Star seems to be sleep-spelling, walking around in her room, randomly casting spells. Naturally, Star freaks out, and asks Marco for help, leading him to take quite an excited interest in her predicament…but, is it really something so simple that a student with an “A” in Psychology can solve? One thing I lamented in the last episode’s segment titled Pixtopia, was a running gag that just never seemed to work (for me). Here, Marco’s eager attempts to peruse Star’s psyche leads to one of the funniest moments so far…and Doctor Marco, PHD is on the case! It gets a little corny, but I dare anyone to watch this little psychological segment and not find at least one thing to laugh at! There is also a little subplot about Marco keeping score about how many times Star has saved him, and vice-versa. I didn’t really feel it added much to the plot, but I was more willing to accept it than the “mess-up twins” subplot of the Pixtopia episode (are you sensing a pattern here?). We also get a new other-dimensional villain in this episode, in the form of Princess Smooshy (voiced by Arif Kinchen). However, she doesn’t seem much more than an attention-seeking Princess-elephant-sleep-goblin-thing(? ), with a plan that seems straight out of a 90’s action film (once you see what it is, you’ll know what I mean). As well, she has a rather ‘horrid habit’ that I think a lot of self-entitled people seem to have these days. There is some pathos within the story, though where it really succeeds, is in the comedy moments, in which both Star and Marco seem almost like a comedy duo, bent on outdoing the other. As well, even Marco’s parents show up for some quick cameos, but each of them makes the most of their limited screen-time. Best honorable mention line from episode (said by Marco): “Glasses! Paper! Clothes! Book! Doc-tor Marco, P-H-D! Well, that was a pretty fun episode! The last few episodes seemed to inhabit the “good episode/bad episode” vibe, but this feels like probably one of the most solid ones since the fourth episode! Lobster Claws comes off a little like Wreck-it-Ralph in the “bad guy attempting to be good” department, but it has enough humor (and even gets a little dark), to make it good. And, unlike Ludo’s last appearance at the tail end of Brittney’s Party, this one feels a little more solid. Of course to me, the real winner of the bunch is Sleep Spells. This is a fun episode in that it seems both Star AND Marco are being a little weird…and, a little wild with what’s going on. The bad guy in this one doesn’t add much to the story, but it’s in the overall execution that makes it most exciting. I’m looking forward to watching this one again real soon! A plus, is that the animation on the two segments, definitely seems to flow a little smoother than episode 6. I just hope Toon City can build themselves to a point where I can (almost) put Mercury Filmworks’ animation style behind me (though it will be hard, considering the work Mercury did on the opening and closing credits is still running with each episode). Let’s face it: out of all the animation studios today, it is PIXAR that has succeeded the most times in hitting us in our emotional sweet spots. In the last two decades, they have managed to make many of us run almost the full gamut of emotions when watching their films, and I’m sure many of us have fond memories stored in our minds of those times. One thing I and many who have been fans of PIXAR have been concerned about, is how it seemed original films from the company we knew and loved, have recently taken a back seat (we’ve had 2 sequels and 1 prequel in the last 5 years). Many like myself, longed to get excited over a new concept from the Emeryville studio. 5 years ago, when I first heard about the concept for Inside Out, it was something that seemed right up the alley from the studio that had brought us something as risky as WALL-E, and was the one film from them that I’d constantly be listening in on some news about. My first taste of what was in store came at the 2013 D23 Expo. The audience there was first introduced to the film’s characters, and we got to see a storyboarded scene. My excitement only grew, as the sequence played out, and the audience was laughing so hard and loud, you couldn’t hear half of the dialogue. It was an exciting communal experience that seemed to be emotionally touching everyone in some way. Of course, delving into the ‘voices inside your head’ is nothing new. 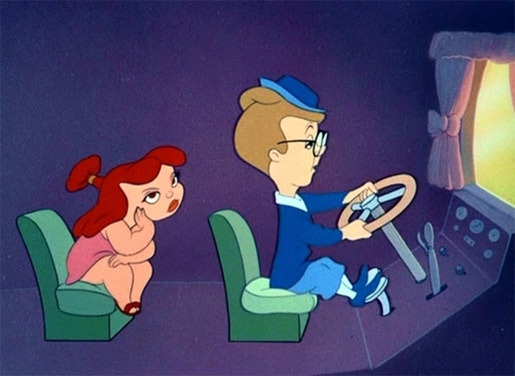 Such concepts have been touched upon in television shows like Herman’s Head, and even the Disney short Reason and Emotion dealt a little with the concept (as seen in a still image below). Of course, what PIXAR’s Pete Doctor was proposing to tackle, was a concept that could have gone anywhere, and with a little less than 2 hours of running time, one had to wonder just how far the studio could take the concept. 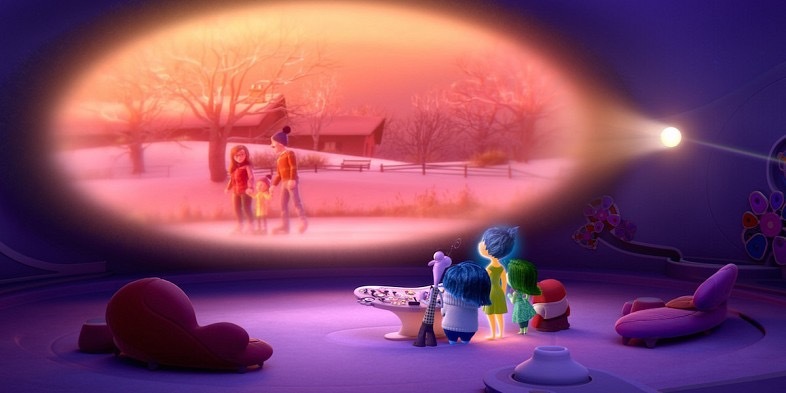 Inside Out revolves around the story of five emotions: Joy (Amy Poehler), Sadness (Phyllis Smith), Disgust (Mindy Kaling), Fear (Bill Heyder), and Anger (Lewis Black). Each of these emotions exist within the mind of an 11-year-old girl named Riley (Kaitlyn Dias). Their world seems to be perfect, until a business decision by Riley’s Dad (Kyle MacLachlan) sends the entire family from Minnesota, to San Francisco. At first, Joy thinks things are going to simple, but soon, circumstances build to the point where headquarters is faced with a few things they’ve never encountered before, sending Joy and Sadness on a journey to the far corners of Riley’s mind. One of the most surprising comparisons I made after seeing the film, was thinking about how much it reminded me of Toy Story. We have multiple characters vying to care for a young child (almost like parents, or relations), and a central figure that tries to be a positive leader. Much like the story of how Woody has to deal with change to Andy’s world, Joy is a character that must deal with the same things happening in her own world. The filmmakers manage to make a character that should be annoying (she is super-peppy), end up as a figure one can want to accompany along on her journey. Normally, it is this type of character, that is usually the sidekick (like Russell was to Carl, in Up). Though Joy tries to find the bright side in everything, Sadness is that one component of Riley that she seems unable to properly ‘get,’ and as such, seems to constantly sideline Sadness. Joy never comes right out and says it (she’s too polite to do so), but the little reactions she makes towards Sadness is more than enough proof for us. The film feels like it gets a little too “busy” during its third act, when it almost seems like the film starts throwing information at us a little too fast. It’s more of a critique than a complaint, but then again, it might be the filmmaker’s trying to ramp up the emotions of the moment. When it came to Inside Out, one person who I was most concerned about, was writer/director, Pete Doctor. To me, Pete has never really been the strongest of the PIXAR directors. Sure, Monsters Inc and Up are entertaining, but it oftentimes feels that he tends to get the heart of those pictures in the right place, but leaves quite a few dangling plot threads in the wind. Some characters and concepts, just don’t feel as properly thought out as they should be (this was also a case I felt, with Disney’s Big Hero 6 last fall). With Inside Out, I think Pete has finally got himself a solid film on his hands. It won’t make you cry buckets like Up, but there’s more than enough here that I think many will be able to be entertained, and a little moved by the story of Riley’s emotions. Of course, every PIXAR film also comes with a short attached! The one that accompanies Inside Out, tells the story of a volcanic island. As the volcano sees numerous animals around him have coupled and found love, he sings his own song about finding someone special for himself as well. Lava is one of those shorts that does so much, with so little. Since the volcanic island we see can’t freely move about, it is the atmosphere and his surroundings that helps tell his story. I was most definitely surprised, as the short moved into the second part of its story, that I was feeling as emotional as I was for the island. The last time PIXAR did a love story, I was a little disappointed. The Blue Umbrella had a nice concept, but it felt like it got lost in a hyper-realized setting. Here, the studio has pulled back enough that the world doesn’t feel like we get too caught up in the details. A fun thing to see, is the sliding mouth and eyebrows of the volcanic island. The way it moves, reminded me a little of the puppetry of Jim Henson and his guys, in that the simplest movements, could convey just so much emotion. I’m sure you’ll see a few couples cuddling close during this short. After a month-long hiatus, Star Butterfly’ is back on Disney XD! Of course, the trials and tribulations of the Princess of Mewni lived on in reruns on the channel during that time. Since then, I’ve seen the fanbase slowly grow. Tumblr accounts, numerous tweets, and…fanart and fan-shipping out the wazoo! But enough talk about the minor nitpicks…let’s dig into our latest episode! When Marco notices a purple heart on Star’s forehead, she begins to freak out, when she realizes she is starting to go through: Mewberty! Puberty has often been equated to some form of metamorphosis that can be considered disgusting by many (and healthcare brands make billions on our fragile teen egos). Of course, with this concept placed on an otherworldly teenager, it becomes both entertaining, yet horrifying. I think that’s largely where my enjoyment of the episode comes from: a place of fascination, and repulsion. Eden Sher’s vocals sound a little weird and stilted as the episode gets started. However, once Mewberty begins to take hold of Star, her voice (and the music of the episode), quickly makes one feel a little uneasy. Much like I hoped for with some of the earlier episodes, we get to see a little more of Echo Creek Academy, with callbacks to several members of the school, and the expansion of some side-characters (including their names!). Speaking of side-characters, one who I wondered about from his first minor appearances in a few earlier episodes, has finally come to light: the miniature, blue-skinned Glossaryck of Terms (voiced by Jeffrey Tambor). He apparently is a component of Star’s wand-instruction manual, though plays like a fast-and-loose support extension of it. If you want any sort of help from him, one has to be prepared to pay…the price. Learning a little more about Star Butterfly and certain information about her dimension, is always a welcome thing for me, along with seeing a little more about her adapting to her new home. The episode’s opening and closing minutes seem a little haphazard, but once the story gets to its main intent, it works pretty well (we even get a brief Spanish lesson at no extra charge). I’m also sure the episode has given plenty of Star and Marco “fan-shippers” more fuel for their fan-crazed fires as well. *Note: a fun little hint of Star’s teenage metamorphosis, was seen in the episode Quest Buy. In the final scene, one can see a book on the floor titled, Mewberty and You. Marco, Ferguson, and Alfonzo make some prank calls on Star’s magic mirror, only to use up all her minutes. This results in them traveling to Pixtopia to pay off the bill. While Star, Marco, and Alfonzo end up working in the shard mines, Ferguson catches the eye of a Pixie Empress (voiced by Anna Camp). The majority of the jokes fall a little flat in this episode, including a hidden meaning joke I’ve heard several times before, to the point that I already had a hint on where it was going. One joke that is played throughout the episode, has Star claiming Marco ‘messed up’ by causing her mirror’s services to be suspended. Claiming he ‘Star’d up,’ she declares them ‘mess-up twins,’ and keeps trying to rub his nose in what happened. What I find rather interesting, is that Star treats this mirror issue like it wasn’t a big deal (I figured she’d be very upset, given that there is the looming threat that her parents could call her at any time on it, and find the services blocked…possibly leading to big trouble). The episode plays fast-and-loose with its storyline taking the characters to another dimension, though it is nice to see Alfonzo and Ferguson as part of the group for the first time, since the episode School Spirit. Though they were last seen in Monster Arm, they didn’t contribute that much to the overall plot. The world of Pixtopia is seen briefly, but doesn’t really give us much information to go on. It seems little more than a location for a quick peek, and then we’re back to Earth. Overall, a rather flimsy episode, that feels like it needed some punching up with the jokes in order to make it a little more passable. Though not an excellent Star vs The Force of Evil episode, I do like how like episode 3, they took a break from using Ludo and his minions, and focused moreso on the interactions and adventures of the teenage cast. And, I finally got to know just who Glossaryck was…though the big question now is, does Star know he is part of her instruction manual, or not? I guess where one door closes in this series, another opens. While awaiting the latest episode of Star vs The Forces of Evil, I was surprised to come across an interesting response string on Youtube. Some had noticed a slight change in the imagery for episode 6 from commercials, and a person who worked on the first few episodes confirmed this. The first 5 episodes had their animation done by Mercury Filmworks in Canada. However, Mercury found themselves overloaded with work, and as such, Star was one of their assignments that they decided to let go of. After the production of episode 5, the animation was moved to Toon City, a studio in the Philippines. There’s been no confirmation just how many episodes Toon City has done, but I’m of the assumption they have taken over duties for the rest of Season 1 (and most likely, the upcoming Season 2). Though Filmworks did assist in transitioning the art style and techniques over to Toon City, one can definitely sense a change. Some of the line work is much thinner in places, and a lot of the cartoony squash-and-stretch smoothness seems to have vanished. I can’t help but feel that the Mewberty segment suffered a little from being the first Toon City episode out the gate. There are some areas that feel a little too ‘stiff’ in places. I’m hoping as the series goes on I’ll be able to adapt to the new studio’s animation style, but I will definitely miss the artistry brought on by Mercury Filmworks. Guys and Gals up at the studio, if you read this, thank you for your services, and good luck in your future endeavors. For those of us who were youngsters in the early 1990’s, Jurassic Park was our Star Wars. It was a film that captured our imaginations, introduced the wonders of what CGI (computer generated imagery) could do…and, made us buy millions of dollars in merchandise! That summer, John Williams’ soundtrack played on my Discman, I collected trading cards and pogs (yes, pogs!) from the film, and washed down those dino-size fries with Coke in my McDonald’s collector’s cup. Following that memorable summer experience, two sequels followed in the next 8 years, but neither of them seemed able to top what had come before. By the time the third film rolled around, the sight of CGI dinosaurs was shoulder-shrugging, and we only saw the human cast as expendable appetizers for the carnivores to feast on. We’ve been so inundated with dinosaurs via special effects, that many had to wonder: as much as we may have imagined a return to that world Steven Spielberg made us believe in, could it ever be as exciting as it once was? That what-if has become reality, in the Colin Trevorrow-directed 4th film in the series, Jurassic World. Around the start of the 21st century, billionaire Simon Masrani (Irrfan Khan) inherited InGen from the late John Hammond. Where Hammond failed, Masrani succeeded: re-imagining the Costa Rican island Isla Nublar, into Jurassic World. 15 years in, it has become a popular tourist destination, with numerous ways to see creatures from the past. On the island, we soon find ourselves caught up in the adventures of Gray (Ty Simpkins) and Zack (Nick Robinson), who represent the awe of youth, and the ‘meh’ of teenage life when it comes to dinosaurs. Also along for the ride is their Aunt Claire (Bryce Dallas Howard), the park’s Operations Manager, who (somewhat like Alan Grant) seems to be at an emotional crossroads in her life. Many people went ga-ga over seeing Chris Pratt as Owen, the film’s equivalent of a “Raptor-whisperer,” in numerous promotional materials. This idea is one that I just couldn’t fully get behind (no matter how manly and roguish Pratt looks), and it seems you may have to believe a little more than I did, in order to buy into the story of a man who has basic control over several 2-legged killing machines. There are quite a number of characters that seem to come and go in the story, including the return of Dr Henry Wu (who we last saw in the first film), played once again by BD Wong. Probably of all the extras, the one who really caught my attention was Jake Johnson as Lowery, a security person in the park, who also seems to be a Jurassic Park fanboy (toy dinosaurs decorate his workstation, and he proudly wears a vintage park shirt!). Of all the characters within the film, it is amazing how almost all his jokes just seemed to hit perfectly, amid a sea of many others that flamed out through the course of the film. One could almost think of him as the avatar to many of the film fans in the audience. Luckily there is no tropical storm this time, but the real behemoth we have to watch out for, is one made through genetic tinkering: The Indominus Rex. Much like how people clamor for “the next big thing,” this Frankenstein’s monster of a dino gives its investors what they want…and shortly after its introduction, exactly what they don’t want. It doesn’t help when you say, “just mash together a lot of genetics,” and not understand what each of these creatures is capable of. With that storyline going on, Jurassic World pretty much becomes just like Jurassic Park: a dinosaurs-on-the-loose story, except with more dinosaurs, more people, and even more examples of how far effects technology has come. Aside from a few minutes of live-action creature effects from Legacy Effects (formerly Stan Winston Studios), all of the dinosaurs are exclusively crafted in the computer, courtesy of Industrial Light & Magic. There have definitely been leaps and bounds in the detail on these dinosaurs, but in a few close-up instances, I couldn’t help but want to believe that that snout poking into the scene was a real, physical creature-effect. One moment that was fun to visually explore, involved a small petting zoo area of the park, where children can ride baby triceratops, and come face-to-face with other small herbivores. I will admit feeling a little worried when one little boy seemed to hug the neck of a small Brachiosaur a little too hard. This little scene reminded me of those moments of wonder that punctuated the first film, when we first saw a Brachiosaur, or witnessed the hatching of a baby Velociraptor. It would seem that Jurassic World should have a simple enough story, but with over 4 screenwriters credited to it, there soon seems to be a little too much going on. We only seem to get small flashes of character development, while the screenwriters also try to squeeze in a subplot regarding a plan for the dinosaurs, that seems all-too-familiar (hint: if you know of what the company Weyland-Yutani keeps trying and trying to do, you can fill in the blanks). To me, this story-point felt too much like a ‘sequel set-up,’ and may leave several people scratching their heads over just what was going on in that part of the story. Inheriting musical duties from John Williams, is composer Michael Giacchino. Luckily, Giacchino doesn’t rely too heavily on the Jurassic Park theme, but I was most surprised to hear what sounded like him paying small journey-filled homages to the lighter moments in Williams’ score for Jaws. The music he uses showing the fun times within the park, sounds similar to the moments in Jaws when Amity Island’s 4th of July tourists start to arrive. As well, he even plays with our memories, when a familiar 4-notes on the french horn, signals the reveal of something…familiar? I had heard Gravity Falls talked of for quite some time over the last few years. Though it wasn’t until I found myself sidelined by another series’ hiatus, did I take the time to see what it was about. The story of the Pine twins being sent to spend the summer with their Great Uncle (“Grunkle”) Stan in Gravity Falls, Oregon, quickly had me hooked. What I found was some great storytelling hooks and jokes, that made me excited for more. Some episodes reminded me of the olden days when The Simpsons had a little more heart to it. As well, the weaving of a mystery underneath the stories and life-lessons for Dipper and Mabel Pines really made me grow to love the series, without making the episodes plod along. I plowed through Season 1 quicker than I expected, and am now at the tipping point like many others, waiting to see what will be revealed with Season 2’s episode 12. With plenty of time on my hands, I thought I’d take the hiatus time to go over my Top 10 episodes of the first Season. I admit it was a little harder than expected, because so many of the episodes were entertaining. This was one of several episodes that really got a lot of attention for its concept. Dipper’s rivalry with Robbie for Wendy’s affections gets a little out of hand when he brings a video game fighter to life, and convinces him to beat up Robbie. The showrunners have fun playing with older video concepts (like Street Fighter II and Donkey Kong). The episode does mark one of the firsts in which the Pine twins break free of each other for their own storylines. The secondary story about Mabel trying to help Stan get over his fear of heights is good for a few laughs, but it feels like a weaker ‘story B’ in the wake of the more fun ‘story A’ that Dipper is involved in. Confession time: time travel has been my weakness ever since seeing Back to the Future at age 6. After the twins encounter a time-traveler from the future, Dipper uses his time-travel device in hopes to be able to end up being with Wendy during the fair at the Mystery Shack. However, Dipper’s plans end up interfering with Mabel winning a pet pig she names Waddles. The episode ends up being both fun and emotional, along with dealing with some of the typical questions about time. For example: can you really change what has happened, or is it an inevitability that can’t be changed? There’s quite a few ‘sibling rivalry’ stories within Season 1, and this one just stood out for me. Why? Well, what better way to demoralize a young man, than to find out his twin sister is slightly taller than him? The episode also brings about the return of Gideon Glee, who reveals more about his terrifying home life, let alone his feud with Grunkle Stan…and leads to one of the funniest quotes from Season 1. Every animated series eventually gets to a size-altering episode, and Gravity Falls got this out of the way just 11 episodes in. It also seems to work well in Gideon’s favor, given his size compared to the adults in this world, he definitely can prove to be quite a threat when he ends up shrinking Dipper and Mabel down to size. Nice to have a little character-building episode shortly after the season opener. Here, Stan attempts to do some family-bonding, taking Dipper and Mabel fishing. Instead, they ditch him to go searching for the legendary Gobblewonker monster, along with Soos. This episode I found entertaining and fun in how it splits up the two adventures. Stan is not much of a people person outside his family, and almost all his attempts to have fun by himself just result in utter (yet humorous) failure. In the case of the Pine twins and Soos, their adventure into the misty waters of Lake Gravity Falls provide the most entertainment, with plenty of crazy antics, along with a great paranoid idea: if you’re going to try and capture pictures of a mysterious legend, take along multiple cameras! We also get introduced to several notable background characters in this one, including one that I didn’t expect to find so entertaining. This was an episode I debated over for some time, and almost wrote it out of the list…but it proves to do so much for an opening episode, paving the way for the future. We get introduced to both Dipper and Mabel, as well as their personalities with Dipper being a little more logical, and Mabel being a little more happy-go-lucky. As well, we find out about Mabel’s boy-crazy moods that will be seen further down the line. A highlight of this episode is still the gnomes, who manage to be both a little and a big story point, hinting at future crazy adventures the Pine twins can have. The episode introduces us to one of the major characters in Season 1, Gideon Gleeful (or “Lil’ Gideon”), a little shiester like Stan, but more beloved by many given his cutesy charms…though under all that makeup and white hair, lurks a very dark figure. One highlight of the episode is in the relationship department. Mabel has often been the chaser, but with Gideon, she finds herself the chasee. We get to see Mabel getting uneasy regarding Gideon’s advances, but is unable to break things off. It’s not often I’ve seen a situational storyline regarding relationships, that is willing to tackle a subject like this. As well, Gideon’s pursuit of Mabel serves as a reminder of how not to go about trying to be with someone, almost reminding me of Gaston going after Belle in Beauty and the Beast. Along with the relationships plot, we also get a prime example of just why and how Gideon can be a thorn in the Pines family’s side, regarding a few revelations. Scooby-Doo and the Mysteries Inc gang could only wish they had encounters that were as cool as this episode! Dipper’s crush on Wendy is fully realized in this episode, when she invites him to come with her friends to explore the closed-down Dusk 2 Dawn convenience store. Dipper soon finds himself making an enemy in Robbie, Wendy’s goth boyfriend, and in trying to convince the others that he’s a teenager (even though he and Mabel are 12). The eerie atmosphere in the episode, along with the synthesizer music makes the scenarios both fun and scary. Though one of the highlights, is Mabel overdosing on a banned 90’s product called Smile Dip. I think these scenes helped push me into really becoming excited over what she would do next. With the show taking place in the summer months, there’s not a whole lot of Holiday-based episodes to produce…so let’s make one up! Apparently, Gravity Falls loves Halloween so much, they created a summer holiday to celebrate it twice a year, thus creating Summerween! Mabel is eager to do some trick-or-treating with Dipper in twin costumes (something they’ve done for years), but Dipper wants to act more mature, and tries to go to a party that Wendy is attending. However, their plans get thrown off course when a towering figure called The Summerween Trickster, shows up at the Pines’ door, threatening to eat the kids, unless they can get him 500 pieces of candy. It’s amazing how much the episode packs into itself: eerie Halloween atmosphere, Mabel being her typical forthright self, and Dipper’s pre-teen angst about wanting to seem more mature to someone he likes. As well, the trickster is an intriguing-yet-frightening character, with an appropriately unsettling voice (and a possible reference to the Hayao Miyazaki film Spirited Away thrown in). The season finale of Gravity Falls definitely upped the stakes where the Pines family was concerned. It seemed that Gideon had succeeded in obtaining The Mystery Shack, and the summer was going to end early for the Pine twins. The episode does end up showing the resourcefulness of the Mystery Shack’s denizens. Notable is in some further character-building for Dipper, beyond the revelations in the episode, The Dreamscaperers. For much of the first season, Dipper has relied on his mystery book, but upon finding it now out of his reach (courtesy of Gideon), he has to rely on himself to get out of certain situations. And…the episode ends on a shocking cliffhanger, that I’m sure made many eager to know what would be coming next. The darker side of what goes on in Gravity Falls seemed to get a little darker than was expected. Triangular symbols had been showing up in the show for some time, and finally, it seemed one of them was shown to have meaning. This came about with the introduction of the entertaining-yet-horrifying demon named Bill Cypher. Summoned by Gideon to get something from Stan’s mind, the journey sends the Pine twins and Soos to follow, and bring the hunky stars of Mabel’s favorite animated movie to life! The episode also is instrumental in giving us some back story on Stan, as well as clear up some issues Dipper has regarding how his uncle treats him. I will admit Dipper’s own mental demons situation felt a little tacked on, but I was willing to go with it, as it did also tie into Stan’s past. The visuals definitely get a little freaky in places, and it seems there’s plenty of hidden secrets within Stan’s mind, that might come into play later. And those are my Top 10 episodes from the first season. Keep in mind these are just my Top 10 choices, and largely based on how I personally feel about the first season. I was surprised how entertaining a good portion of the episodes were, making it a pretty strong first season/introduction. I figure once Season 2 finishes up, I’ll review all those episodes, and see what sticks. As it stands now, I think Season 2 will definitely keep me hooked on what is to come. Creator Alex Hirsch did mention in one interview, that he saw the show taking place over the span of an entire Summer Vacation, with maybe 3 seasons worth of material. I personally feel that would probably be for the best, with ‘3’ being the magic number by the looks of things (triangles have 3 sides, after all). With the announcement in 2013 that Studio Ghibli’s co-founders Hayao Miyazaki, and Isao Takahata, were releasing their final animated features, many film fans were thrown into turmoil. The same uneasiness was felt when rumor quickly spread that their swansongs, would mean the end of the famed studio as well. Co-founder Toshio Suzuki (a producer on numerous Ghibli films) quickly put the rumor to rest, claiming the studio would focus on smaller-scale projects instead. While this allowed some to breathe a sigh of relief, this meant sadness for many beyond the realms of Japan. After all, to many of us out there, the films from Studio Ghibli were what reached our shores (most of the time). Some would have figured that Isao Takahata’s The Tale of Princess Kaguya would be the final film released, but it turned out, there was one more left. In the summer of 2014, Ghibli released their ‘final’ animated feature, When Marnie Was There. Based on the novel by Joan G Robinson (though the setting has been moved to Japan), the film follows 12-year-old Anna Sasaki (Takatsuki Sara). After an asthma attack, her mother Yoriko (Matsushima Nanako) sends her off to stay with her Uncle and Aunt in a small town near the sea, claiming the air will do her good. After exploring the seaside town, Anna’s attention is drawn to an elaborate structure on the far side of the village, that the locals call The Marsh House. One evening, Anna goes exploring there, and is surprised to run across a blonde-haired girl named Marnie (Kasumi Arimura). Of the many different main characters explored in Ghibli films regarding children or teenagers, Anna is quite drastic, being very quiet, and somewhat “expressionless.” One assumes that maybe she is this way due to her asthma, but it seems she may have some emotions bottled up inside. Her mother explains to a doctor that Anna used to be very happy, but seems to have become withdrawn, rarely speaking to anyone. One of Anna’s outlets is her sketchpad, in which she often draws, but seldom shows others. I was rather pleased to see another artistic teenager in a Ghibli film, one of the first since 1995’s Whisper of the Heart. Anna seems to cope better with just drawing, fancying herself an observer on “the outside,” rather than wanting to be someone on “the inside” of life. Even though those around her largely try to be polite and enthused towards her, Anna seems to rarely give in. This seems a little odd, when she seems willing to give in and meet with Marnie, who seems so lively and boisterous. As well, Marnie at times tends to get pretty ‘close’ to Anna. I saw the film in a theater of only 5 people, and it made me wonder how a larger audience would have reacted to some of these moments. Marnie as a film, definitely feels ‘different.’ Much like Goro Miyazaki’s film From Up On Poppy Hill, it seems moreso enamored with trying to make the ‘magic’ moments seem more natural, and not as elevated into the realms that Hayao or Isao would have gone to. This is a film that almost feels like the newer generation attempting to get its feet wet, but I could see how the story could leave some feeling a little ‘flat’ in the end. Anna’s largely ‘blank’ expressions quickly put me in mind of the enigmatic-looking Jiro Horikoshi from Miyazaki’s The Wind Rises. Though luckily, Anna doesn’t hold her stoicism as long. Much like Hayao Miyazaki has his themes, it seems that director Tomomi Mochizuki has his as well. The director of 2010’s The Secret World of Arrietty, one can find some story parallels to that film, and this one (an ill young person, sent away to a place where strange encounters may await, for example). With Arrietty, Tomomi had a guiding hand in Miyazak-san, but here, he’s been left largely to his own devices. One of the highlights of the film, is the wonderful score by Takatsugu Muramatsu. Before I knew it, I was swept up in the melodies that wafted over the seaside town, as Anna and Marnie made a connection. As well, the closing song by Priscilla Ahn encapsulates the film so well. Titled Fine On The Outside, it feels like a song that many would be able to relate to. In the end, I was surprised to find that while I had fallen in love with the music and visuals of When Marnie Was There, I had not been swept up in the film’s most important part (to me): its story. Even thinking back to films like From Up On Poppy Hill and The Secret World of Arrietty, those films managed to entrance me with their characters, let-alone the stories they were telling. This film could possibly have been Tomomi Mochizuki’s attempts to steer into new territory for Studio Ghibli, but I think many like myself, feel that you still need to give us some more investment in the characters. As well, the structure of some scenes left me scratching my head a few times. The feelings I had reminded me of how I felt about the recently-released film, Tomorrowland, in which like Marnie, the visuals and music stuck in my head, but the story just didn’t tug at my heartstrings. Though I have wondered now, some time after seeing it once, what I’d think of it if I had to watch it again. This could be like some films where the first impression may take on new meanings upon repeat viewings. Even so, my first impression of When Marnie Was There, turned out to fall short of my expectations. There seems to be an emotional sterility with the film much like with The Wind Rises, making me long for the emotionally affective levels that I experienced with Isao Takahata’s The Tale of Princess Kaguya.